Do kids have to mean the end of the multi-modal dream? The Yuba Train with rice cooker. Photo by Mark Stosberg. This piece was first published in the January 20th, 2015 edition of Metro News Vancouver. Earlier this month, former Vancouver director of planning Brent Toderian mentioned on CBC Radio that he and his wife are expecting a child and will strive to raise a family without owning a car. As I’ve reached the age where my friends’ babies are becoming a permanent fixture of my Facebook feed, my interest in this topic has only grown. It’s a key thing for Vancouver city and region to get right. Being a parent has been identified as one of the strongest determinants of car ownership. In Vancouver, there has been some excitement about the so-called U-Pass effect — of people taking up transit during university and sticking with it once they leave; but can it last through to the life milestone of starting a family? Curious, I asked a few families — mostly new parents with children under 5 — how the transition from multi-modal, car-free couple to car-free family was going and whether they thought they were going to be able to stay that way. Juggling work and daycare was a common theme for everyone. When daycare is close or on the way to home or work, pairing transit with car-sharing can suffice. For others, work demands add complexity that make even occasional transit trips intolerably time-consuming. 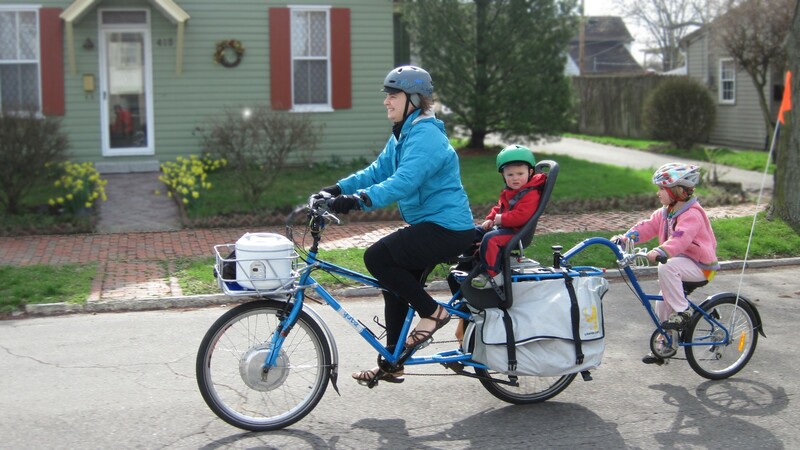 For one cycling commuter parent, infrastructure like separated bike lanes and end-of-trip facilities like secure bike trailer storage at destinations are essential. Just about everyone noted the helpfulness of car-sharing. Some bristled at having to become on-the-fly car seat installation experts, hoisting heavy seats in ways they were never designed to be used. As weekend trips to see grandparents across town or go further afield to enjoy natural areas become more of a regular fixture, the cost of doing so with car-share or rentals can start to make car ownership look appealing. Everyone I spoke to had no end of words about the tradeoffs. On the upside, no car payments allowed some parents to work less, pursue education and more free time with their child; to pay down debt; or to travel and connect with family. Children on transit means immersing them into the life of a city — exciting at some moments, nerve-wracking at others. Time not spent driving can be vital alone-time for parents to de-stress or care for their own physical and emotional health. For some, the frustration of balancing commitment to action on climate and addressing immediate needs and opportunities, along with reducing inconvenience, was apparent. I know other families who’ve made it work — sometimes as their children (yes, even multi-child families) age, becoming pedestrians and cyclists themselves; or as living and work situations evolve. But we will not achieve our transportation goals until we meaningfully support parents’ trips and destinations, and make living car-free more pain-free. Want to read more on car-free child-rearing? See the author’s Afterword for this column. sustainable transportation planning & technology ponderer. I work with @vpsn, sometimes @apa_technology.